A YouGov/ Telegraph survey of 661 current members of the Conservative Party suggests that David Cameron will be the next Conservative leader and that he will win an overwhelming majority. YouGov predicts that Mr Cameron will win 67% of the vote, against Mr Davis' 33%. That result echoes that of this site's new Conservative Members' Panel. New members are still being recruited to this panel but the 'who would you most like to be the next leader of the Conservative Party?' question produced overwhelming support for David Cameron. Before the panel was promoted to non-visitors to this site, 848 Tory members had joined it. 552 said that they were voting for David Cameron and 249 for David Davis. Excluding the don't knows this gives David Cameron 69% of the vote and 31% for David Davis. ConservativeHome's panel is much younger than the Conservative membership as a whole and can only be taken as indicative at this stage. If the two surveys are more or less accurate Mr Cameron is set to secure a huge victory over his opponent. If Mr Davis secures only 30% of the vote Mr Cameron's advisers will be encouraging the new leader to demote him to a position like Defence (many visitors to this site predicted as much in their Fantasy Shadow Cabinets). Mr Cameron faces 'congestion' in his shadow cabinet decisions with George Osborne, Liam Fox, William Hague and Mr Davis all leading candidates for the top three portfolios of Chancellor, Foreign affairs and Home affairs. 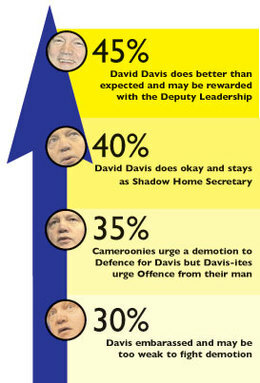 If Mr Davis performs surprisingly well - 40% and more - he will be impossible to move. Well, if it is as the survey suggests, it will certainly be a the ultimate test of his good sense and 'niceness' as to what he does with David Davis. Davis has been a brilliant Shadow Home Secretary. I think Fox and Rifkind have been fairly undistinguished in their Shadow roles. My guess is he will leave the status quo for a while and then have a huge clearout and out will go the old guard. I really do hope that I am wrong and that he is as 'nice' as he seems. Actually he probably is nice but I can't say the same thing about some of those around him. What I just won't want to see is a 'kitchen cabinet' of all the Notting Hill bunch and that is my fear. David Davis ends this campaign better known and stronger than he entered it. In recent leadership votes there hasn't been a Cameron like candidate. In another scenario Davis could have won, he deserves a significant position. Difficult call between him and Fox though as to who will stay in the top 3 jobs, with Hauge likely and it sounding as though Osbourne will stay up there too. In reality there are too many good candidates for too few traditionally 'top' jobs, but if we are to be the next government we need recognisable, capable people in a vast range of jobs, I hope Davis wouldn't see Health, Defence or Trade as too much of a demotion. Letwin has raised the profile of the environment portfolio we need other upper-middle rank jobs to receive the same treatment. Also how about giving Ken Clarke a place in the Lords and swiftly promote him to leader there. We need to win on every front in both houses for the next 4 years that requires Davis & Clarke. If he does get around a third of the votes then David Davis's refusal to accept the constructive opposition strategy means that in areas where a DC led opposition would want to do that (Education, Health, perhaps Works and Pensions or even the Home Office) he would be unsuitable. Shadow Leader of the House is often used as a place where someone difficult is placed...need to look at a job with reseaonable profile where destructive opposition is a strength. DD must equally accept that with less than a third of MPs and around a third of party votes he may lead a significant faction but he doesn't command enough to demand one of the top 3. If he does do better than forecast - perhaps getting 40% plus then DC needs to offer the Deputy Leadeship and a high profile post. It'll be more difficult because DD will rightfully claim "case not proven" for the "Change". This will be the first major test of Cameron's leadership. Will he be able to fill the "Big 3" positions without any sort of backlash from the party? Part of me thinks that Fox will be moved to Shadow Leader of the House, leaving room for Hague to take the Foreign Affairs portfolio. Davis is a good Home Secretary. Cameron would be wrong to move him from such a position - he will reassure people that the natural party of law and order is here to stay. I don't know who'll get the deputy leadership, though. Hague would be an excellent Shadow Chancellor but it looks as though Osbourne is here to stay. At the start of the campaign I would have supported Davis being left at Home Secretary, however as the campaign has gone on and Davis's attacks have become more desperate and vitriolic I am not sure that unless he secures 40% at a minimum Cameron will have any choice but to demote him. "Slavishly follow Tony Blair?" Pur-leeaaase. I think that Davis is likely to be demoted (unless he breaks 40% on Tuesday, in which case he’s got a 50/50 chance of being retained as shadow home sectary). The simple fact is, as Kate maintains, that there are just too many good people for the number of posts on offer. With Hague as Shadow Foreign Sectary and Osborne retained as Shadow Chancellor, there will be a number of people with a good case for filling the shadow home affairs brief most notably Fox. So in short I think Fox going to Home Affairs, and Davis to Defence is both the most likely and desirable outcome, providing solid ideological balance, I’d tentatively suggest that Fox is more genuinely sound than Davis on the key social issues which impinge upon the home affairs brief and in contrast to Davis’ sometimes corrosive influence on the leadership Fox seems a far more amenable and cooperative sort of politician. I know some political considerations will come in to it but surely DC should only promote people who has got the talent to do the job. I suggest that DCs team should first write a job description for each vacancy. Then he should match talent to the job requirements. The job description should include such items as communaction skills,leadership skills, ability to get on with other people, presentation skills, must be team player etc. They should also be able to think on their feet and have the ability to become champions of the conservative cause. They should be no room in the Shadow Cabinet for by-standers. Bearing in mind the above criteria who do you think out all our MPs should be in the shadow cabinet. Finally, I think we should all thank Tim for all the good work he has done in keeping this site going during this very important leadership race. Well done and best wishes for your new ideas reference the future of the site. Whoever wins on Tuesday would be well advised to see just how bloodied Gideon Osborne is by Brown on Monday; and just how Blair performs against the Leader of The Opposition on Wednesday. So MPs are pressing for a 22% pay increase ? That should be an interesting debate for Conservative MPs to define themselves. When our armed forces are in conflicts like Iraq and Afganistan risking there lives if defence isn`t important then we dammed well should make it important. If DC moves DD to defence it shouldn`t be seen as a demotion for him but as a promotion of defence to its rightful importance. Babs. When David Cameron is putting together his cabinet its his duty to do what is right for the party and not be "nice" and hand out jobs like they were sweeties. Also the slur on those around DC is not called for. What I have read is that they are a crowd of generally nice people who are basically in politics to serve. Barbara Villiers: "I think Fox and Rifkind have been fairly undistinguished in their Shadow roles." 1. Championing of human rights - eg in Burma and Uganda - and the establishment of a special cttee under Gary Streeter MP to champion this issue within the party. 2. Decision to quit the EPP. Fox took this initiative in September and DC has followed. 3. Unyielding line on the war on terror. Where's Sir Malcolm been this week? Pensions have been in the news and he's been very low profile. Nelson: Really, all the MPs should have those skills to become MPs in the first place. I think Davis has proved himself quite a superior Shadow Home Secretary, but I can understand that there are other talents in the party he wants and needs to keep on-side more, perhaps, than Davis. In an ideal world, I would actually like Davis to be put in charge of a new "Security" portfolio, dealing with all aspects of the war on terror, Iraq, domestic security, border policing etc. Make him the front-man for Conservatives on the War on Terror, while Fox would be dealing with domestic Home Office issues. But, of course, in terms of opposing Labour in the Commons, there's no "Minister for Security" so there can't be a "Shadow Minister for Security". I think that that offering Davis the Deputy Leadership regardless of his result would be a wise gesture of party unity on Cameron's part. As to whether or not Davis will stay as Home Secretary, I suspect that Cameron is going to want to put his own stamp on the front bench and that will involve moving Davis out of Home Affairs. Osborne seems a certainty to remain as Shadow Chancellor now that Hague has made it clear that he could not accept the post at this time due to previous business commitments. Hague will become Shadow Foreign Secretary, and my guess is that Fox will become Shadow Home Secretary. As per my entry on the Fantasy Shadow Cabinet thread, my guess is that Davis will become Deputy Leader and Shadow Leader of the House of Commons, which will give him a prominent role within the party and in Parliament. It will be great to have Hague back on the front bench, but it's a pity that Shadow Foreign Secretary is such an invisible job where domestic politics are concerned. If Cameron has any sense at all, he will sack Davis sooner or later. Better do it now. Not so anyone noticed...........and I don't think the regime in Myanmar gives a damn what Fox does.......it is Asia and has heavy Chinese influence; that regime doesn't care what you say or do. Amazing - well not really, that the Cameroonies on this site can't evn be gracious in 'victory'. let's do keep in mind that most of the MPs that went to Cameron were opportunistic ship jumpers so to say that Cameron has 2/3 of MPs is fatuous to say the least. Jack, as far as thinking Cameron is surrounded by such 'nice' people who just want to serve all I can say is that if you were at Westminster you would know that the 'nice' people around him are the ones urging him to demote Davis. All I can say is fasten you seat belts, we're in for a bumpy ride! Fighting the leadership hasn't stopped David Davis from making some pretty serious inroads on the Government and he has been fighting the leadership longer than Fox and certainly longer than Rifkind. The truth is we haven't had a really outstanding Shadow Foreign Secretary for a long time - Michael Ancram, nice as he is, didn't ever set the world alight while I thought Dr. Fox was a very good Shadow Health Secretary. I am still scratching my head trying to figure out why Malcom Rifkind was even given a safe seat to fight (when there was so much new talent available) let alone a place in the Shadow Cabinet. No doubt I will be accused of being not nice but I just speak as I see it. That is just ridiculous. I thought better of you than that. There were plenty of opportunities for Fox to shine and he hasn't. Davis fought passionately and intelligently on those two bills and for you to negate that really surprises me. You really do disappoint me. David Cameron is most emphatically NOT nice. He's probably the least nice of the whole Notting Hill set. However, he has a reputation for being nice. Which is exactly how we should want our political leader. "Barbara": politics isn't about 'graciousness' it's about Power. DC needs to do what he needs to do. 'We need to win on every front in both houses for the next 4 years that requires Davis & Clarke'. blogs K.Castle. We need Davis I agree - along with Fox Hague IDS and many others. But we do not need Ken Clarke. Did you miss his disloyalty to Cameron on Channel 4? The Times, The Economist and Channel 4 are all running with Alistair Campbell's latest news narrative that Cameron must not touch the corruption of the EPP, and cause a Euro-row. KC was filling the screen attacking Cameron's declared policies when he has just been booted out for the third time by MP's/Members. He is not interested in the Conservative Party's views so what the he££ is he doing as a Conservative MP? KC must be deselected by Rushcliffe. He's been told to rein it in by his constituents, but he only listens to his masters in Brussels. Portillo was the ultimately disloyal Conservative. Ken Clarke is his replacement. CLARKE MUST GO, RUSHCLIFFE. YOU'RE LETTING THE PARTY DOWN. Ken Clarke doesn't seem to mind a bit of this kind of EU thing. Do you? Then quit the EPP as Cameron says we should. Only Ken Clarke seems to find this this croneyism/corruption lovely jubbly. In July 2004, Portuguese politician José Manuel Barroso was nominated as the new EU Commission president. In August 2004, he and his family enjoyed six days free hospitality on a luxury yacht owned by Greek shipping magnate and multi-billionaire Spiros Latsis. In September 2004, the Commission gave the nod (under EU state-aid rules), to a €10 million grant to the Lamda shipyard, in which Mr. Latsis has a substantial interest. It does begin to look like the last decent one was Ernest Bevin, since his time the Prime Minister has tried to run Foreign Policy and sideline the Foreign Secretary - Eden of course thought he had foreign policy genius, but he botched on a major scale and Mac knifed him. I heard that CCO had almost noone working on foreign policy, so I doubt there will be anything coherent from the Tories or Dimwit Straw in this area.